Dzongu is the untouched heaven in the northern Sikkim with a striking beauty. Mountains, streams, waterfalls, thick forests, tiny beautiful Lepcha hamlets, absolutely pollution free air and divine calmness is what characterizes the place. It has been recently opened up for tourist and it is yet to attract hoards of the tourist as tourism is not well developed yet. Only 4-5 Home Stays are available. This makes Dzongu a very memorable experience in itself. There are no standard itineraries available to explore Dzongu. You have to make the plan on your own with the help of Home stay owners. If you indeed want a non-commercialized nature stay, this is the place. Walking, trekking, taking baths in rivers/waterfalls/hot water spring, birding, running behind the butterflies, visiting tiny hamlets, enjoying local cuisine and staying in traditional Lepcha houses is what you can enjoy here. Below given information would help you plan your stay. You can plan a week's visit to this area still you wont cover all of it. Lingdong Village The village is situated in Lower Dzongu. One can easily see Mangan on other side of the valley. River Tista flows through the valley which separates Dzongu from Mangan/North Sikkim highway. There is Home Stay available here (Dzongu Lee) where we stayed. There is monastery uphill between Lingdong Village and Barfok village. Its 1 hour easy trek from Lingdong. The specialty of this monastery is it is for nuns. On the way, you can see Cardamon fields. You can enjoy the breathtaking view of the mountains from this. When we visited, it was a time for festival called Eung-ney. Monks there invited us for the fast-breaking lunch. It was a superb feast for us. 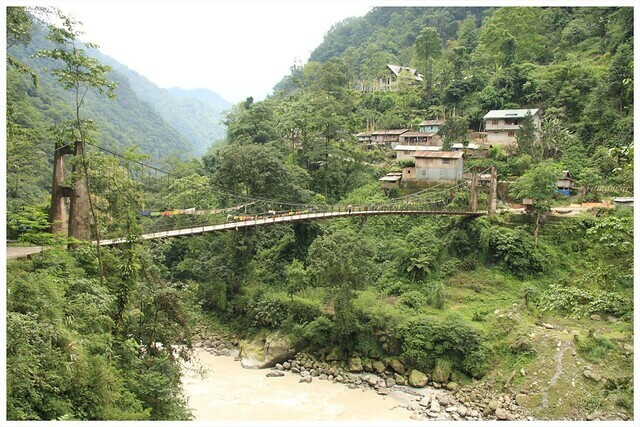 4 kms from Lingdong towards south to Hee Gyathang, passes Rin Khola rive which further meets Tista down the valley. Immediately after you cross the bridge on the river, one can easily go down to the river bed and enjoy bath. There is another bamboo bridge used by locals to cross the river which one must experience. Hee Gyathang Village Hee Gyathang Village lies in Lower Dzongu and can be easily reached from Lingdong. It has a small sacred lake decorated with prayers flags. Namprikdang Village A model of a Lepcha house constructed in its traditional style is built at the confluence of river Teesta and Rongyoung. Surrounding environment of the museum is a perfect spot for family picnic. The confluence is just a 5 minutes walk from there. 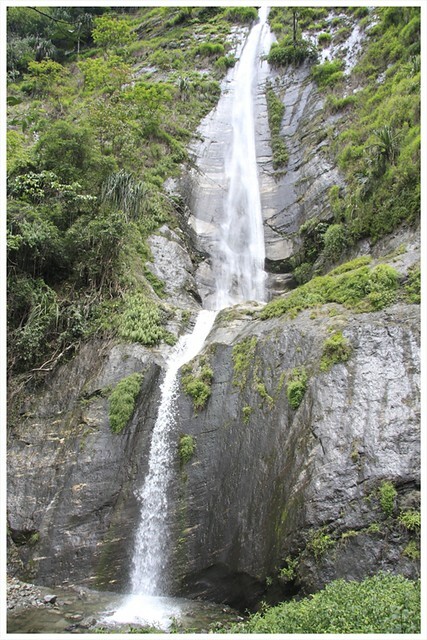 Lingzya Waterfall Half an hours drive from Lingdong village in interior Dzongu towards Pentong passing through Nom, Passingdang, Mantan, Shibim villages lies this wonderful waterfall. At Mantan, one road goes right to Tingvong/Lingzya villages and the one goes left towards Ruklu-Ringdem. The drive is scenic passing through mountains and bridges and tiny villages. Though the water was cold, having bath under the rapid stream is something we didn't miss. Ruklu-Ringdem Village From Mantan take a left towards Kayeem and Ruklu-Ringdem villages. Those villages are on opposite side the valley, other side being Lingzya waterfall. Rongyoung river divides the valley which further meets River Tista. Somewhere near Kayeem, there is a hot spring with separate enclosures for males/females. You can soak in the bubbling Sulphur water at a leisure. There is a small restaurant just ahead of the hot water spring which serves tea/Maggie etc. On this route from Mantan to Kayeem, on a clear day, you can see Mount Khanchendzonga. Below are some other spots which we didn't visit but gathered information about it from Gyatso Lepcha, owner of the Home Stay (for future planning). Lingthem A trek through bamboo groves from Passingdang village takes you here. The trek offers breathtaking views of the Mt Khanchendzonga. It also has a monastery. There is Home Stay available in Passingdang village (Mayal Lyang homestay) . Tingvong & Kusong Both the villages are in interior Dzongu on the mountain slope before Lingzya waterfall. Tinvong village can be reached by road. Kusong village requires an hour of trek upwards from Tinvong. On the way to Kusong, there is monastery. There are two Home Stays available here (Tingvong Home Stay and TECS Homestay). Pentong and Sakyong These are the last inhabited areas of Dzongu giving very closure view of the snow clad mountains. 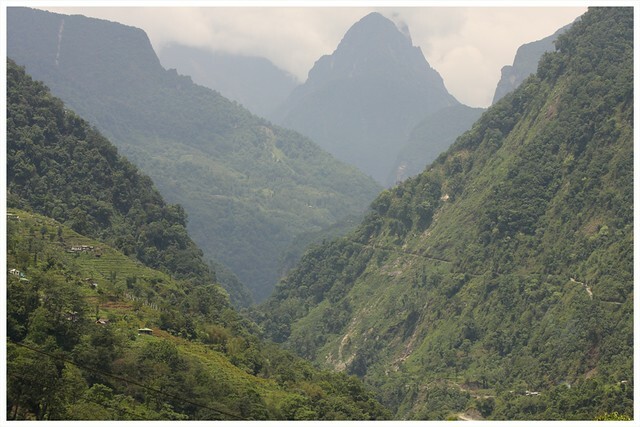 By road you can only go only upto Lingzya and after that it takes around 5 hours or so trekking through dense forest. On the opposite side of the valley lies another village, Sakyong. From Sakyong, you can trek to Ruklu-Ringdem village through Leven village. Keushong Keushong is considered the most beautiful place in Dzongu which has a very beautiful lake, also called as Keushong Lake, surrounded by hills. It takes 5 days to complete the trek from Tingvong. On day 1, you reach Tholung Monastery and take a halt. Next day you reach Keushong, third day at Keushong and other 2 days to return through same route. You need to arrange in advance with the Home Stay owner who would arrange Lepcha guides.